Since the date, Yahoo! disabled the classic version of Yahoo! 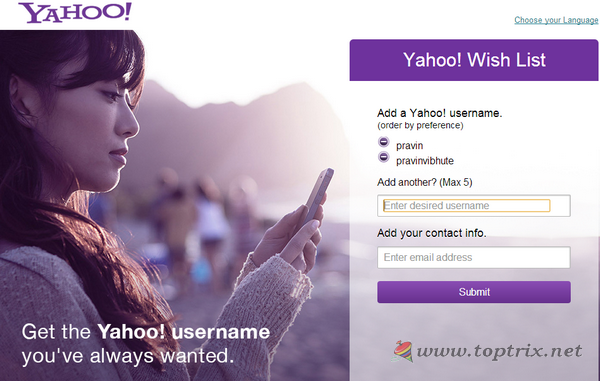 Mail, and asked the users to validate the user ID active by logging in at least once, many Yahoo! fans were waiting for acquiring their favorite username. The waiting time is now over and Yahoo! 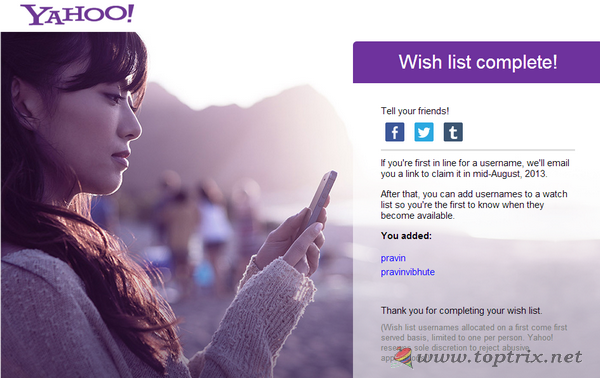 has announced that it will provide inactive usernames to other users who claim it. And distribute it on a first come first serve basis. You have a choice of 5 user name preferences and you will be notified by contact email you provide with the wish list form. So if you are using Yahoo! and have added some joker tags and numbers after your desired user name, it's time to fill the wish list form and claim the clean and simple Yahoo! user ID. If you are lucky to get your claimed username, you will be notified in mid-august. Visit the Yahoo! username wish list page here.